Buffalo Nickels have won a permanent place in the hearts of many Americans, including mine. However, this interesting and very beloved coin should actually be referred to as the Indian Head Nickel rather than the Buffalo Head Nickel, as the buffalo is actually on the reverse (back) of the coin. The Indian Nickel was minted from 1913 to 1938 from 75% copper and 25% nickel. It features a Native American profile on the front (obverse) of the coin and a buffalo on the back (reverse). The Indian profile is actually a composite of three different Indian chiefs. They are believed to be Iron Tail, Two Moons and John Big Tree. This was the first time actual Native Americans were used on coins. All previous coins depicting "Indians" had actually been Caucasians wearing an Indian headdress. The buffalo on the reverse is actually an American Bison, and is modeled on "Black Diamond", a famous buffalo of the time at the the Central Park Zoo. 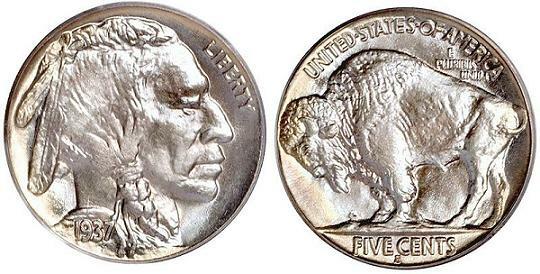 This buffalo was the first animal other than the bald eagle to be featured on a US coin. An interesting story about Indian Nickels (and some other coins) is that people would sometimes carve the Indian portrait into another face. These coins became known as "hobo nickels"
The Indian Head Nickel has two variety types and was produced at three US Mints: Philadelphia, Denver and San Francisco. Have you seen any three-legged buffalo lately? Well on some of the 1937-D Buffalo Nickels, the poor buffalo is missing his right front leg. It seems the guys at the mint were trying to repair a damaged die and inadvertently removed part of the buffalo's leg. Many of these coins were already released out into circulation before the goof was noticed. 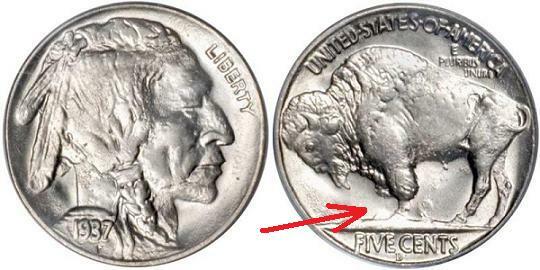 So keep your eye out for three-legged buffalo, they are valuable coins! 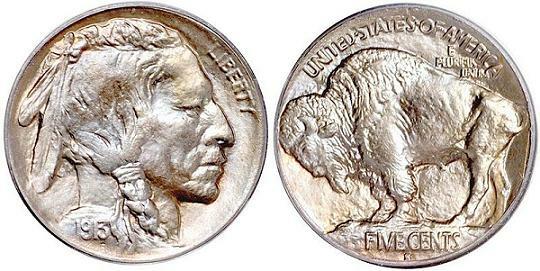 The Buffalo Nickel is making a come back after almost 70 years. The US Mint released the Westward Journey Nickel Series of coins in 2005 to commemorate the bicentennials of the Louisiana Purchase and the Lewis and Clark expedition. 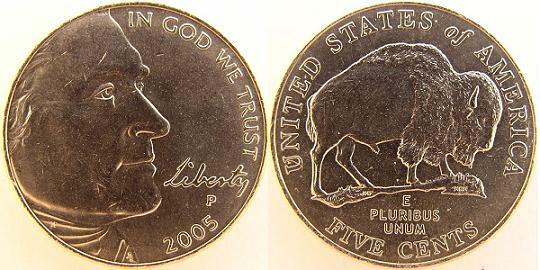 One of the coins in the series features Thomas Jefferson on the obverse (front) and an American bison on the reverse. For some great deals on U.S. Buffalo Nickels and Coin Supplies visit my friends at Jake's Marketplace, Inc. They have a very comprehensive selection to choose from and give great discounts!